Virtual Desktops’ features have been Linux’s greatest selling points. This useful tool allows Linuxers to work with multiple applications at once. The Linux Virtual Desktops offer multiple desktop areas whereby users can enjoy working with multiple environments. Users can set up a virtual desktop for office suits and another for a graphic program, etc. Users do not need to close, minimize or maximize the running applications but just move from one virtual desktop to another. With similar features to Linux’s Virtual Desktop, Windows users can now enjoy Windows OS via a newly released freeware from Microsoft Sysinternals, Windows Sysinternals Desktops v1.0. 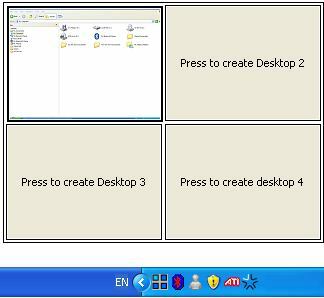 Desktops Version 1.0 allows users to organize and split their applications to a maximum of four virtual desktops. Users can run a drawing program on desktop 1, browse info in desktop 2, type on desktop 3 and read email on desktop 4. 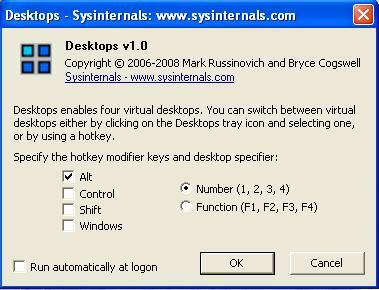 Desktops V 1.0 also allows users to switch between these virtual desktops either by clicking on the Desktops tray icon and selecting one, or by using a hotkey. Users can specify the hotkey modifier keys and desktop specifier during installation. For instance, users can choose to use Alt + Number keys, e.g. Alt + 1 for desktop 1, Alt + 2 for desktop 2 and so on. Users can download Desktops V 1.0 via the direct link here. Another plus point of this application is its tiny size, approximately 117KB which doesn’t consume a lot of computer resources.